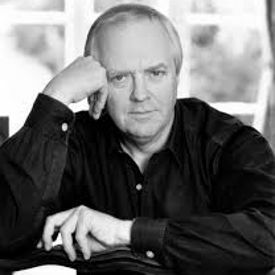 Sir Tim Rice is a prolific English lyricist, well known for his collaborations with Andrew Lloyd Webber, Elton John, and Bjorn Ulvaeus and Benny Andersson amongst others. Rice was born in Buckinghamshire in 1944 to army parents. He initially decided to pursue a career in the law but, after studying at the Sorbonne in Paris for a year, he left to take up a position as a management trainee at EMI Records in the mid-1960s. While working in the music industry, Rice began collaborating with Andrew Lloyd Webber. Their first musical, The Likes of Us (1965), would not be performed for forty years but they went on to write Joseph and the Amazing Technicolour Dreamcoat in 1968. Originally written as a short piece, the pair expanded it into a full stage show and it became an instant hit. Rice and Lloyd Webber went on to write Jesus Christ Superstar, releasing it first as a concept album in 1970 and then evolving it into a stage show the following year. Their final collaboration occurred in 1976, with the stage production Evita. The musical was made into a film in 1996 with Madonna in the lead role of Eva Perón, winning the Academy Award for Best Original Song for “You Must Love Me”. In 1984, Rice teamed up with former ABBA songwriters Benny Andersson and Bjorn Ulvaeus to write the music for the musical, Chess. Again, this was written firstly as a concept album and, upon its critical success, the musical premiered in London in 1986. During the 1990s, Rice worked with Disney on a flurry of projects, including Aladdin (1992), The Lion King (1994), and the stage version of Beauty and the Beast (1994). Rice was knighted by Queen Elizabeth II in 1994 for his services to music. He also has a star on the Hollywood Walk of Fame, and was named a Disney Legend in 2002. In 1999, Rice was inducted into the Songwriters Hall of Fame.